A guest op/ed writer argues that the "15 Now" movement has nothing to do with inflation, productivity, or a "living wage." This is a guest post by Max Nelson, the labor policy analyst at the Freedom Foundation, an Olympia-based nonprofit seeking to advance individual liberty, free enterprise, and limited, accountable government in Washington, arguing against proposals to raise the minimum wage in Seattle to $15 an hour. In it, he argues against the three arguments made by minimum-wage proponents like venture capitalist Nick Hanauer, who says the minimum wage has failed to keep up with inflation and productivity, and is not a "living wage." PubliCola (or the C Is for Crank, anyway) has been an advocate for the higher minimum wage. The frenetic push for a $15 minimum wage in Seattle has some sensible observers asking the question: Why not $14 or $16? And if increasing the minimum wage is good for the economy, why not boost it to $50 an hour? At this juncture, minimum wage advocates typically chuckle nervously and tell the impertinent questioner to calm and down and be reasonable. After all, nobody is arguing for anything that drastic. Admittedly, the current state minimum wage does not go as far as it did in 1968. But 1968 was the year that the purchasing power of the minimum wage in Washington hit its all-time high. When pressed for specifics, though, proponents typically rely on three arguments to justify a dramatic and arbitrary minimum wage boost: the minimum wage has failed to keep up with inflation, the minimum wage has failed to keep up with productivity, and the minimum wage should be a living wage. None of these benchmarks stand up to scrutiny. The refrain that the minimum wage has failed to keep up with inflation is a well-worn progressive talking point. Proponents typically compare the purchasing power of the minimum wage in 1968 ($10.79 in today’s dollars) to the current value of Washington’s minimum wage ($9.32). Admittedly, the current state minimum wage does not go as far as it did in 1968. But 1968 was the year that the purchasing power of the minimum wage in Washington hit its all-time high. The average purchasing power of the minimum wage in effect in Washington (sometimes the federal minimum was higher, sometimes the state wage floor was higher) since the creation of the minimum wage in 1938 is $7.79, well below the current rate. In other words, our current minimum wage is not out of line with its historic value. 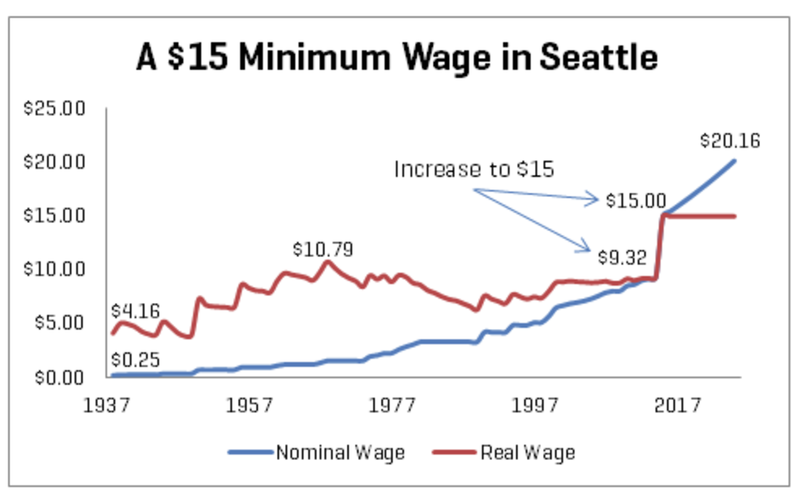 Labor advocacy group Puget Sound Sage recently repeated another favorite statistic of the #raisethewage crowd: If the minimum wage had kept pace with the productivity of the average worker, it would be north of $20 an hour, making the push for $15 seem reasonable. There is a hefty problem with this argument, however. The productivity-minimum wage contrast was first promulgated by the left-leaning Center for Economic and Policy Research in 2012, which compared increases in the productivity of the average worker to the increases in the purchasing power of the minimum wage. But an apples-to-apples comparison would examine whether the value of the minimum wage has kept pace with the productivity of the average minimum wage worker. While the Bureau of Labor Statistics (BLS) does not track minimum wage workers’ productivity, it recently released information about the productivity of a close proxy: fast food and restaurant employees. According to the BLS, labor productivity for these workers increased by an average of 0.6 percent per year from 1987 to 2012. Over the same period, pay for these workers increased by an average of 5.1 percent per year. Washington’s inflation-adjusted minimum wage has increased an average of 1.3 percent per year from 1987 to 2012. Put simply, the purchasing power of Washington’s minimum wage grew twice as fast as restaurant worker productivity, and restaurant worker compensation increased more than eight times as fast as productivity. Heartless statistics aside, advocates of a higher wage floor contend the minimum wage should actually be a “living wage.” Conceptually, a living wage is supposed to represent the minimum amount a worker needs to “make ends meet.” There is little agreement, however, about how to calculate that amount. Estimates of a living wage for a single worker in Seattle range from $9.64 an hour to $17.55 an hour. Taking family size into account adds an entirely new dimension to living wage calculations. Should the minimum wage be high enough for a single worker to support a family of any size (for example, a single parent raising six kids)? What about the many minimum wage earners who are not the primary breadwinners in their household? If the reason for increasing the minimum wage cannot be traced back to economic indicators like inflation and productivity or the amorphous concept of a living wage, why $15 Now? Kshama Sawant says it’s because “$15 has captured the imagination of working people,” but that’s not really an argument.